Of the projects in Love at First Stitch... I skipped over blogging about the simple head scarf (and I've never worn it - I swear my head and hairline are not shaped right for things like that); I showed you my Margot PJs and Delphine skirt; finally blogged about the Megan dress and the three Clemence skirts I made. The next pattern in the book is the Mimi blouse, which is cute but 100% not my style (I like more fitted, usually stretchy tops - the boxy look does not do it for me). So I skipped that one. Which brings me to the last project in the book - the Lilou dress! I really like the style and fit of this one - of everything I've made so far, it definitely feels the nicest. I think the main downside is that it feels a bit too nice - more of a party dress than an everyday dress. I used a really sturdy woven cotton, which makes it feel high quality but not necessarily extra fancy. I may keep my eye out for something a bit more glitzy and possibly make myself a holiday party Lilou someday, since that's really my main excuse each year to dress up. The trickiest thing about picking fabric for this dress is that it requires 60" wide (instead of the more common 45" wide). I basically just looked around my fabric store until I found something that matched the description the pattern gave (medium-weight with body, I believe) and which was also wide enough, and solid black it was. 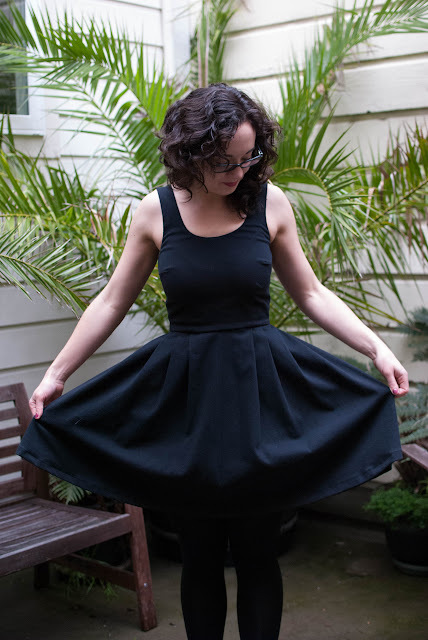 I think this started my new routine of making each new dress pattern in black first, since plain black dresses are probably my very favorite thing to throw on in the morning and instantly feel put-together. I'm definitely having a black phase with my clothing and I love it. It's been a little while since I sewed this (like.... August 2015), so I can't remember all of the details. I did spend some time on fitting the bust first - I made a muslin out of the lining fabric, I believe, and adjustments were mostly bringing side seams and darts in tighter, so I didn't need to cut new fabric for the final version. 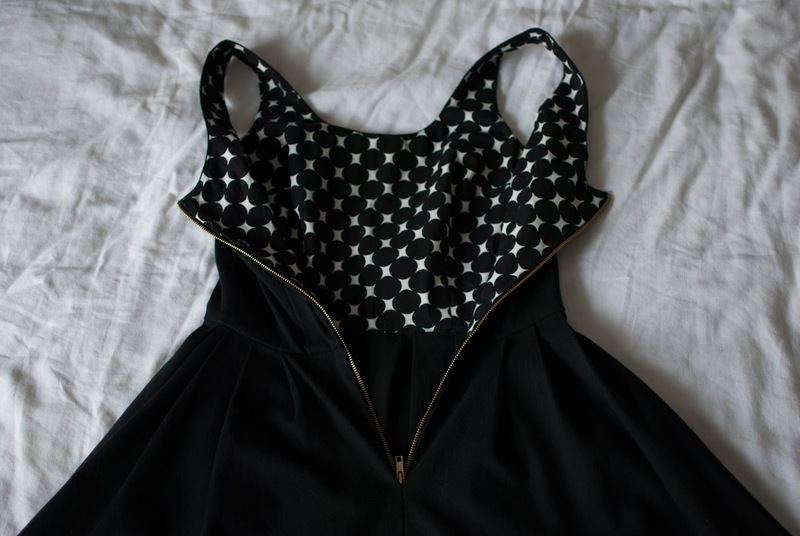 After many invisible zipper projects, I was over inserting them and decided to go with a regular zipper for this one. I worried a black plastic one would look cheap, so I got a metal coat zipper and I'm really happy with how it looks! My fabric is heavy enough that it all feels very stable, even with the extra heavy zip. 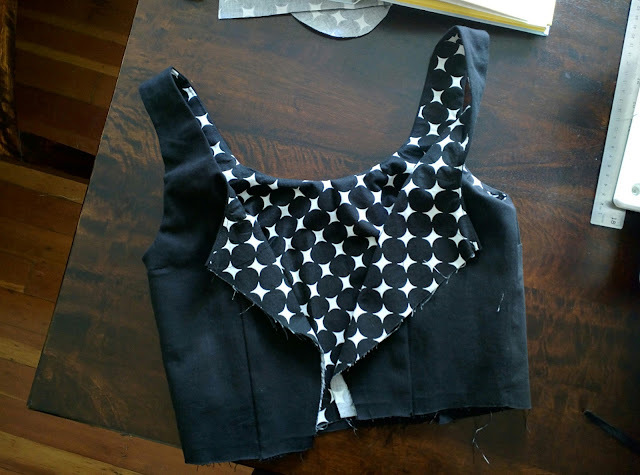 Attaching the lining + outer bodice. This was really cool to learn! You attach all along the neckline and the arm holes, then connect the side seams for each the lining and the bodice, then do some magic and flip it all right side out and it's so cool, especially the very first time. 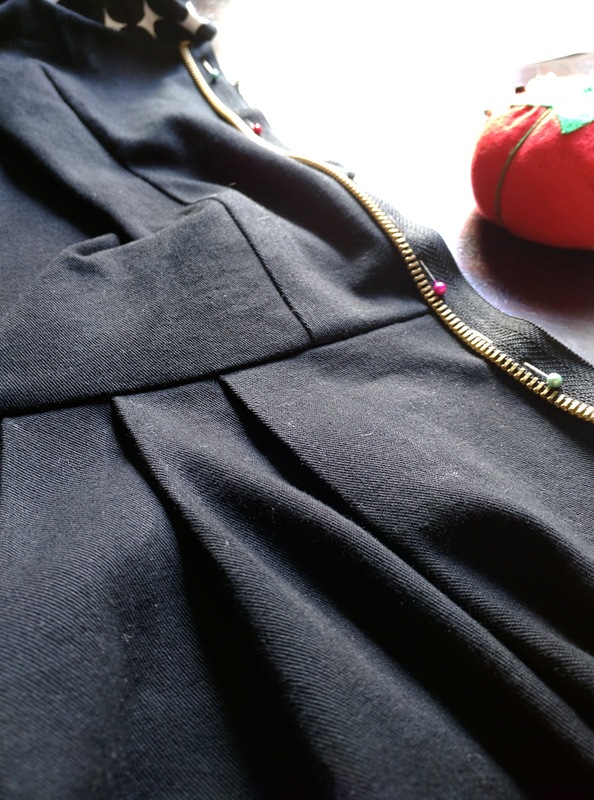 Close up of zipper attachment + pleats details - I really love how well this fabric holds pleats! The downside of black is: really hard to photograph. 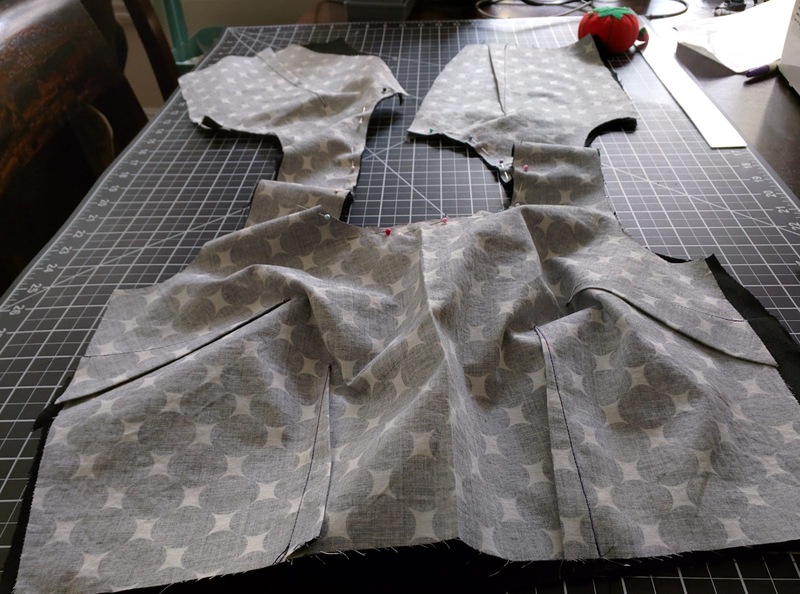 What I learned: How to line a bodice - this one is great because I've since learned that I hate using binding tape on arm openings and especially necklines, so sometimes subbing those out for lining is my best bet; pleats! 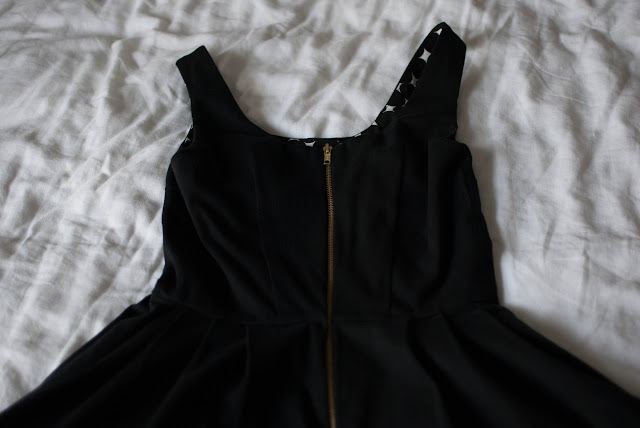 ; sewing a non-invisible zipper. That's it for Love at First Stitch projects, but I wasted no time in moving on to other indie sewing patterns once I got through it all. More to come! Hi Caitlin! Wow, amazing dress. Just beautiful and the fit is impeccable. Well, odd question for you. I randomly ended up here from the Love And First Stitch hashtag on Instagram. You have a kickass blog and while reading some of your posts, I noticed you live in San Francisco. I live in West Oakland and am interested in improving my minimal sewing skills. 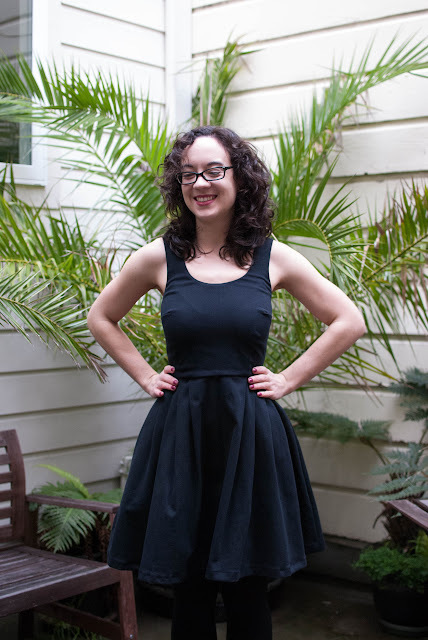 Have you happened to take any sewing classes in the Bay Area, or are you self taught from the book? Just curious. I wasn't sure how I should begin. Thanks so much! And again, love the blog. All the best. Hi Sara! It's so exciting to get a comment, thank you!! :) (I don't generally promote my blog much at all and I don't think that many people read it...) Anyway! I haven't actually taken any sewing classes around here, mostly just taught myself via Love at First Stitch and googling, and I've managed to find friends who know more than I do who I can bug online if I have issues. But, a friend told me about Apparel Arts in Oakland and that is sort of a dream of mine now, if I can ever find the time to commit (http://www.apparel-arts.com/). The patternmaking and design program looks really intense but also amazing (and you can just take part of it if you don't want to do the whole thing). For something less involved, I've heard good things about the classes at Stonemountain and Daughter in Berkeley, but I haven't made it over there yet. I hope this helps! Best of luck with sewing! !